During IEA SHC Task 51, Solar Energy in Urban Planning, the project partners evaluated the legal, process and education issues of solar in urban planning across the twelve member countries. What they found was: Planners and architects know little about the opportunities of solar energy usage. Solar energy in urban planning is also rarely a topic during university courses for architects or urban planners. 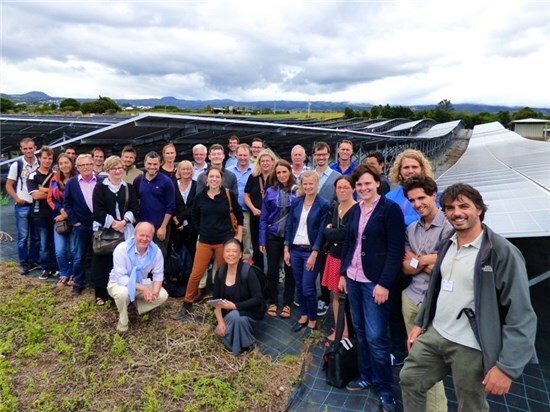 The photo shows participants of the latest Task 51 meeting visiting a big PV installation. The meeting was held on the French island of Réunion from 28 September to 2 October. The task is about all types of solar energy. Maria Wall is the only woman currently heading a task of the IEA SHC programme. “I am happy that we have a high number of female researchers in our task – almost 50 % of the more than 40 active experts – because it is a lot about communication, action research and training,” emphasises Wall. She has a master’s degree in Architecture and a PhD in Engineering and heads the Division of Energy and Building Design at Lund University in Sweden. Wall also developed a Master of Science programme called Energy-Efficient and Environmental Building Design. It is held at Lund University and was launched in September 2012. Task 51 lists the key questions which urban planners need to be able to answer to make well-founded decisions on solar strategies: What potential does solar technology have to provide energy for new or existing housing stock? What are the criteria for a good mix of different solar technologies – solar thermal, photovoltaics and also passive solar use, such as the use of daylight and solar warmth through windows? Which buildings are suitable for solar heat or solar power? How can a well thought-out building integration facilitate the use of solar technologies in historical town centres? When is it favourable to build a solar field at the outskirts of a city instead of many small roof installations? After evaluating the teaching situation, the Task 51 experts aim at a web-based learning platform to help disseminate information on solar energy in urban planning. The platform is thought to contain documents on best practice examples, but also tools and methods for decision-making. Additionally, there are plans to create seminars, workshops and summer schools. Besides educational measures, the task’s experts also employ a special kind of interaction process with selected municipalities to establish an exchange between researchers and city managers. “This approach is called ‘action research’ and it means that we participate in selected ongoing urban planning processes within the participating countries and facilitate planning by showing successful practices and pitfalls already encountered by others,” explains Wall. “We also support the processes by analysing the solar potential and using methods and tools to test applicability and develop it further.” The experiences will be compiled in the form of case studies within subtask C.
The sixth project meeting took place on the French island of Réunion. The French overseas department intends to do away with fossil fuels in the electricity sector by 2020 and in the island´s total energy mix by 2030. The programme included a visit to the construction site of the new housing area, Beauséjour. The area follows the example of the eco-city of Freiburg, Germany. The use of solar water heating systems is mandatory for all buildings. As the generation of PV electricity has grown drastically over recent years and the small island grid is getting into trouble managing solar electricity, Beauséjour does not allow PV systems. The task meeting ended with a joint workshop of task experts and local actors to exchange ideas and experiences. Task 51 is a follow-up project of Task 41, Solar Energy and Architecture, which was also initiated and led by Wall and ended in April 2012. “Task 51 took the step from individual buildings to urban planning,” Wall says. According to Wall, solar energy integration does not only mean promoting solar. “It is important to also look at the entire planning process and how to take into account solar energy when many other aspects have to be dealt with at the same to achieve a long term urban energy strategy,” she points out. The task started in May 2013 and will run for four years until the end of April 2017.